I have been wondering about this for quite a while and have not been able to find any reason for the above - advertising by the governments. Why does the Govt of India need to air adverts in India showing how much the country is progressing? If it were a political party doing it, I would understand. But, a government? Isn't it hilarious? Unfortunately, the people in power don't find it funny and before each elections the political party starts airing these ads with big portraits of their leaders and pass it off as a government expense. So sad is the state of affairs in India. This came to my notice first with the India Shining campaign launched by the then NDA Govt. Now it is a Congress campaign. And recently I saw an ad by Uttar Pradesh (UP) Government on Aj Tak - a national channel, promoting the progress made by the state of Uttar Pradesh under the Mayawati rule. At least, have the courage to bear the expense from the political party's coffers. Not to say that the political parties collect money in a legitimate way. Recently there was a case about a murder in connection with collection for party funds and hardly anything was done about it. Coming back to the UP Govt ad, it ran for almost a couple of minutes. If the money that is being spent these ads were diverted to development, for each run of the ad we could change the life of a couple of poor kids (or maybe, even more) forever. But the government is meant to boast about its so-called accomplishments rather than actually doing anything on ground. Another thing that I have noticed of late, given that the elections are around the corner, are the full page ads that are given in national dailies proclaiming the inauguration of one service or the other in some place. 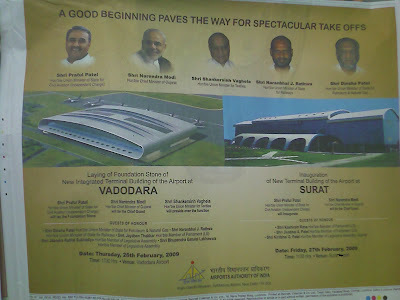 The ad will contain half a page of pictures - of both central and state ministers from that area. It feels so irritating to see tax payer's money going down the drain with no constructive use whatsoever. I would propose that a legislation should be brought that the Governments should not be allowed to advertise about their achievements or inauguration of a scheme or something. But then, I realise, who will bring about this legislation? At the risk of being off the point, MPs decide their salary in India. Now that must be a tricky legislation for them. There are a lot of things in Indian system that need to change. But then again the rhetorical question is - who is going to do that?